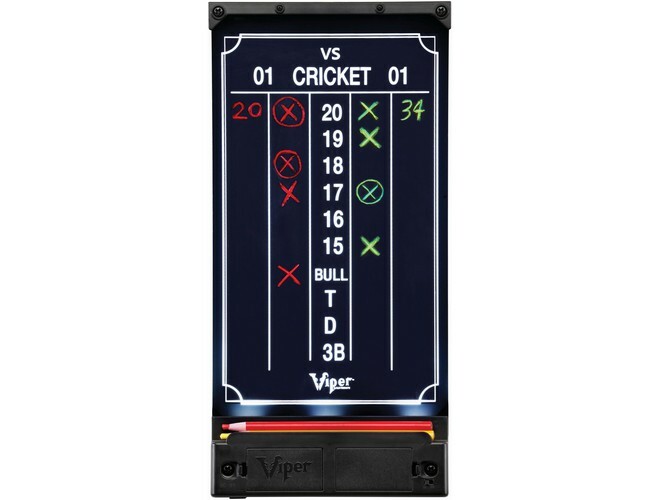 You’ll see your name up in lights when you record your scores on the Viper® IllumiScore illuminated dart scoreboard. Write on it with the included grease pencils and watch as your score illuminates like a neon sign. Simply wipe the smudge-free marks away with a dry cloth when the game is done. Perfect for any gameroom. The IllumiScore can be mounted to a wall or a dartboard cabinet. Requires 4 AA batteries or power adaptor (not included). 15.35" X 7.48" X 1.18"